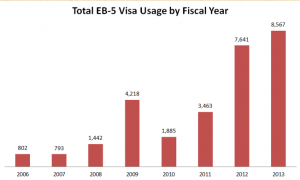 that informs the public of the availability of visa categories for that particular month, that the EB-5 industry was warned that based on then current demand patterns it was likely that the availability of EB-5 visas for investors from China with I-526 approvals (and their spouse and children under 21) would be backlogged due. The reason for this is a combination of: the total number of visa available annually to all employment-based immigrant visa categories, the number of EB-5 visas available annually, and the per country caps per category once its annual allocation has been exhausted. With 8,567 of the annual EB-5 visa allocation of 10,000 issued in fiscal year (FY) 2013, the December 2012 warning from State never came to fruition in FY2013. However, recently reported data from Chief of the State’s Visa Controls Office, Charles Oppenheim, indicates that it is unlikely (absent Congressional action) we can avoid a backlog in availability of EB-5 views to investors and family from China in FY2014. In just the first couple of months of FY2014, 4,748 EB-5 are spoken for already. That number is up 50.2% in the same period as last year. With the prospect of “retrogression” (the technical term for a backlog in visa availability) looming as the EB-5 industry moves toward the 10,000 visa quota, there are several wide ranging implications that IIUSA members should pay close attention to. From an immigration standpoint, the investor’s ability to file for Adjustment of Status or Consular Processing will be delayed as a result of a backlog of I-526 petitions, which would lead to Child Status Protection Act (CSPA) considerations for “age out” situations. For Regional Centers, job creation and capital redemption timelines will be impacted by a lag in visa approvals. Also, such a delay would create issues with funds sitting in escrow, potentially leading to concerns regarding project development and whether the EB-5 capital will be available when needed. From a securities perspective, new risk factors for private placement memoranda (PPMs) would arise as a result of retrogression. Issuers will have to disclose the potential risks associated with the new reality. Lastly, other country’s with immigrant investor programs will use retrogression to compete with EB-5. 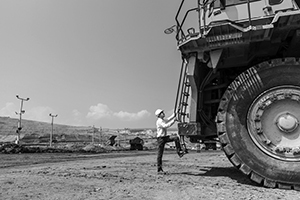 Another bright spot is the potential for mining rare earth elements in the Silver State—terbium, dysprosium, europium, ytterbium and more. An existing deposit in California near the Nevada border suggests those elements are present here.